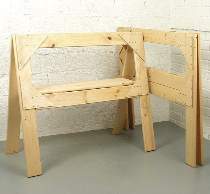 Sturdy sawhorses that fold to an ultra slim 2" thickness for real space saving storage. Opened, they provide a sturdy 31"H work surface with a wide center shelf. Make from 3/4" stock and 1/4" plywood. All patterns drawn FULL SIZE. Order Hardware below, or see Special. Folding Sawhorses Hardware includes 16 each 960 1-3/8" x 2-1/2" brass plated hinges and 300 ea F347 3/4" x #7 flat head screws enough for one pair of sawhorses. Project plan, remaining wood and wood finish are not included. Save with the #1887 Special which includes the #W2427 Plan and #1876 Hardware.